Field of view: 132m@1000m degrees. Supplied accessories: case with strap, neoprene strap, rainguard, tethered objective covers, lens cloth. A Caiman is a neotropical alligator. There are six in the range with the biggest weighing over 1000kg. 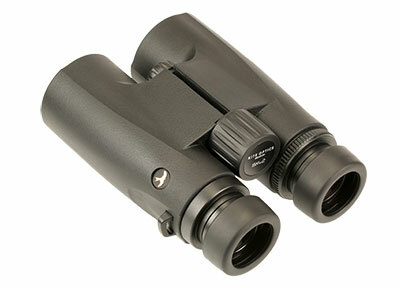 It’s also an entry-level binocular from Kite, weighing under 700g and with an RRP of £249. There are two in the Kite range – an 8x42 and a 10x42. I reviewed the 8x42. The Caiman is a well-made binocular with a look and feel that wouldn’t be out of place on a more expensive product. The design is quite simple, with no ‘let me tell you where to put your thumb’ indents, and tasteful branding. I found it quite chunky in the hands – and I liked that. It didn’t feel heavy, the focusing wheel is well-positioned, and the eyecups are comfortable. The chassis is aluminium, and the Caiman is rubber-armoured, and waterproof. 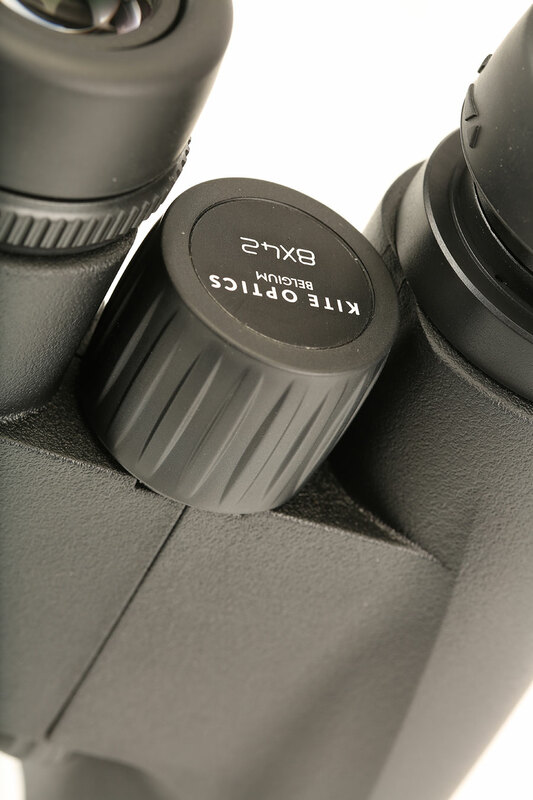 A knurled ring on the right eyepiece adjusts the dioptre. Once set, it’s unlikely to move, but could be just a bit stiffer. The rubber-covered eyecups twist up and down, with a good, reassuring action, and one intermediate position. At 17mm, eye-relief is pretty good and should be enough for glasses wearers. Note that the 10x have a little less eye-relief (15mm). Unlike some binoculars, the Caiman’s eyecups are made of aluminium and are easily removed for cleaning, or even replacement. Sunset was approaching and hares were up and about. I wanted to test the Caiman’s low-light abilities, so carried on using them after sunset. The image was still good 20 minutes later. I kept going. With sunset more than half an hour behind me, I could still see some colour, shades of green, on a distant tree, and an impressive level of detail in the hedge. The Caiman’s low light performance hadn’t disappointed. Don’t forget, this is an entry-level binocular. Its reptilian namesakes do well in low light, too. The Caiman’s deliver a gentle, natural view. Sharpness is good but don’t expect the punch and pin-sharp quality of a much more expensive bit of kit. Brightness is good and this low-cost binocular coped well against the light. I sometimes saw a bit of colour fringing but overall it seemed pretty well corrected. Field of view is very good – there’s no hint of claustrophobia – and close-focus is better – Kite say 1.5m, I say 1.6m. The 1.5 finger-wide focusing wheel moves smoothly, with moderate resistance through 1.5 revolutions, anti-clockwise towards infinity. But for most birding less than 0.25 turn is needed, which isn’t much. I found the focusing took some getting used to – I had to hunt for best focus sometimes – a gentle touch was required. So don’t rush this binocular – take your time to get the best out of it. It’s nicely made, with good sharpness and brightness, and very good field of view, close-focus and low-light performance. But be gentle with the focusing.